There are five circumstances in which Raymond Davis, the American killer caught in Pakistan, might have diplomatic immunity. They are these. 1) He was notified in writing to the government of Pakistan as a member of diplomatic staff of a US diplomatic mission in Pakistan, and the government of Pakistan had accepted him as such in writing. 2) He was part of an official delegation engaged in diplomatic negotiations notified to the government of Pakistan and accepted by them. 3) He was a member of staff of an international organisation recognised by Pakistan and was resident in Pakistan as a member of diplomatic staff working for that organisation, or was in Pakistan undertaking work for that organisation with the knowledge and approval of the Pakistani authorities. 4) He was an accredited diplomat elsewhere and was in direct tranist through Pakistan to his diplomatic posting. 5) He was an accredited courier carrying US diplomatic dispatches in transit through Pakistan. 2) to 5) plainly do not apply. The Obama administration is going for 1). 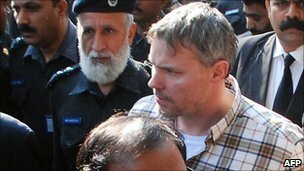 My information, from senior Pakistani ex-military sources that I trust, is firmly that the necessary diplomatic exchange of notes does not exist that would make Davis an accredited US diplomat in Pakistan, but that the State Department is putting huge pressure on the government of Pakistan to overlook that fact. This passes a commonsense test - if the documents did exist. La Clinton would have waved them at us by now. A brilliant article here by Glenn Greenwald.